I’m on a a super secret mission. Actually, I don’t think it has to be a secret but it is super and it is a mission. I’ve been delivered and book that has yet to be released!!! I get the honor of reading it and then writing mean, judgmental reviews about it. Just Kidding, I’m confident that it will be a great read and cause me some great introspection. The Author is Bo Stern. She wrote Beautiful Battlefields and next up is: Due out Early January!! I’ve read the introduction and I’m already going to tell you go pre-order some for each and every one of your family members and friend! This is going to get you! Each chapter has questions at the end!! I love Questions! I spent a handful of years writing questions for the sermons at church that would lead each person who chose to, into a deeper understanding of the message. These questions will allow me to journal and share with you what God is doing in my little life. I hope you enjoy the journey with me over the next few blogs and perhaps you’ll choose to pick this book up and give it a try. If you haven’t read her first book you really must. So maybe just go buy that one and read it now so that you can understand what I’m talking about when I say you just really have to get this new book coming out in January! Its probably bad form to mention other books while kind of doing a little review on an author, but Bo is my friend and I’m sure she’ll understand that I can’t resist an opportunity to tell you what else is on my reading shelf right now. Yes, she does it to, reading multiple books at one time is probably a problem that plagues most lifetime learners. 1. One Thousand Gifts by Ann Voskamp. Favorite quote thus far from the book “Our fall was, has always been, and always will be, that we aren’t satisfied in God and what He gives. We hunger for something more, something other.” She references a quote from Gravity and Grace by Simone Weil that says “Every sin is an attempt to fly from emptiness”. True, yes?! Are you reading books that stretch you and help you dream? Are you reading books that draw you closer to God? 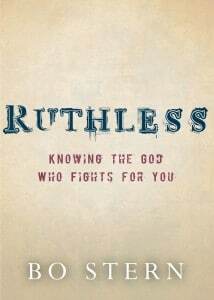 I am and RUTHLESS is one that is gonna put some definition around my understanding of the GOD who fights for me! We’ll start tomorrow with a list of a few things that I know to be true about God!